If you’re looking for creative ways to save money for your first home, you may want to consider building a second dwelling on an existing property! There are several things to think about, but building a second dwelling on a parent’s or relative’s property could be a way for first-time buyers to rent cheaply while they save. In this week’s episode of Real Estate Matters, Toni talks to town planner Melanie Ellis about the types of outbuildings you might build on an existing property, the legal statuses of different types of outbuildings, and what to do with them when you move out. Outbuildings on an existing property are often colloquially referred to as “granny flats” – traditionally used by a widowed relative for convenience, with a bit of added independence. Legally, though, that term has no meaning, and Melanie explains to Toni two official terms: dependent persons’ unit and secondary dwelling. She also explains why secondary dwellings require planning permits, but dependent persons’ units don’t, and what might lead you to choose one over the other. 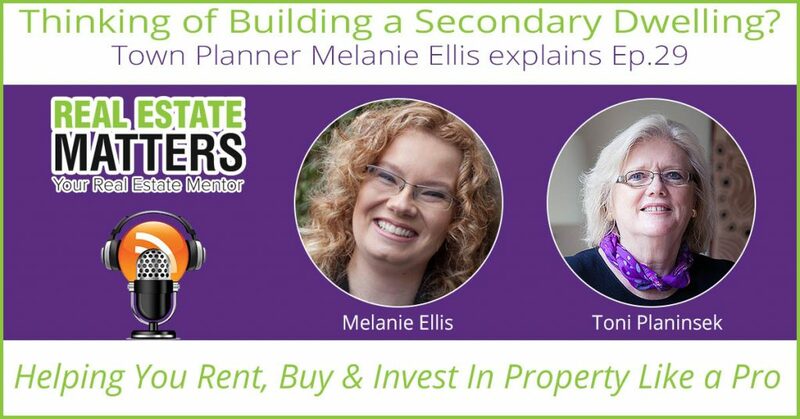 Finally, Toni and Melanie explore the feasibility of installing a secondary dwelling on an existing property, and whether it achieves the goal of providing cheap housing while a relative saves money for their first house. Melanie is a town planner who has been working in the industry since 2000. In her role as an independent town planner, she works with individuals to get planning permits, a process that can be confusing and time-consuming without professional advice. Is a secondary dwelling permanent? Which types of outbuildings need planning permits? What defines an outbuilding as a secondary dwelling/dependent persons’ unit versus just a studio/shed/etc.? Is building a second dwelling feasible as a way to save for another property?